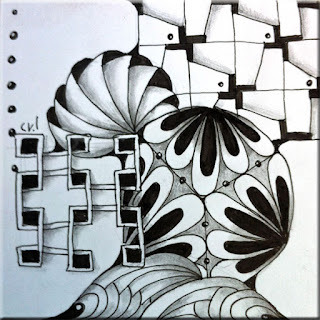 As usual, your Zentangles are an inspiration. I have to find out what these particular patterns are! I see you used 'dillo, one of my most favorites lately. And you gave Mr. Armadillo a black pearl of an eye, very nice! I hadn't thought of trying that. And i was able to look up Gottago, i think that is what that is, have to try it soon! Your many years of artistic experience shine through in all your work!